Choose the type of facility you would like to have (e.g. mixed streets), and then reduce the speeds and volumes of traffic to an appropriate level. This approach is appropriate when the designer’s intention is to emphasise an informal, calmed, relaxed town or village centre, or perhaps where the road is so narrow that there is no possibility of dedicating space to cycling. Determine the design speeds and volumes of traffic according to the regional and/or local sustainable traffic plan, and provide the appropriate cycling facility for that regime. 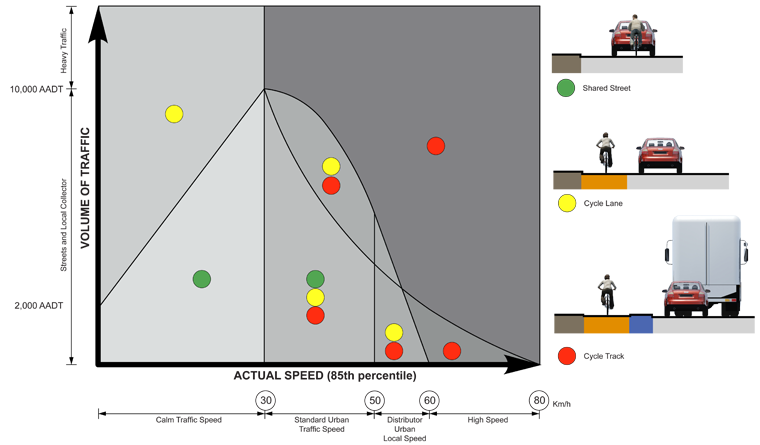 The guiding thresholds in this graphic represent the most widely internationally-accepted values of traffic speed and volume for various cycle provision options. They are approximate values in their scope, to give designers a sense of the appropriateness of their design solutions. It beholds the designer to ensure that the Principles of Sustainable Safety, especially, Functionality, Homogeneity and Legibility, are applied to each design, regardless of the solution(s) offered in this graphic. A bus or HGV is equivalent to 3 PCUs (passenger car units). A busy bus lane (e.g. a bus every minute, and regular taxies) could have as high a traffic flow (in PCUs) as the next traffic lane. A busy inbound urban traffic lane within a signalised system carries between 650 – 850 PCUs per hour. The actual speed of traffic can be quite different to the signed speed limit for the road, especially off-peak. In some cases, the roadspace may need to be re-configured to ensure that speeds of traffic are no higher than the designer intends within the design. Traffic lane widths are an important consideration. With the exception of primary distributor roads, traffic lane widths should not exceed 3m in general. (see Traffic Management Guidelines, and in Table 9.2: “Typical Lane Widths”. ). Further guidance on Speed and Traffic Calming can be found in the Traffic Management Guidelines, Chapter 6, Table 6.1(b) “Traffic Calming on Existing Roads”. Average urban commuter cycling speeds are up to 20km/h. Where weaving occurs, the Dutch advice (CROW) is to limit the speed differential between bicycle and traffic to 10km/h, in order that bicycles can weave in front of vehicles with relative comfort and safety etc. For this reason, the 30km/h speed limit (ensuring it is observed) becomes central to the concept of mixed traffic. Beyond 50km/h actual speed, the relative speed of vehicles to cyclist is getting high (30km/h or higher). In relative terms, cyclists travelling at 20km/h in a 50km/h zone are equivalent to pedestrians walking along the road with their backs to traffic, within a 30km/h zone. In reviewing the graph, the threshold of 10,000 AADT is important. At 30km/h actual traffic speed, this represents the maximum level of traffic flow at which mixed cycling is likely to be the most appropriate choice. 10,000 AADT is roughly equivalent to 1000 PCUs in the peak hour, or 666 PCUs inbound in the morning peak hour. At 50km/h actual speed (the standard urban speed limit) the maximum traffic flow is 5,500 AADT if mixed cycling is preferred. This is equivalent to 360 PCUs inbound in the peak hour – a relatively low volume of traffic. In general, and under the Principle of Legibility, this manual does not recommend designs that intend cyclists to slew across multiple lanes of traffic for right turns. While some experienced cyclists may negotiate such manoeuvres, where possible, the designer should provide an appropriate crossing arrangement in accordance with the Principles of sustainable safety. In many situations, right hand turn pockets are introduced simply because the space exists. Right hand turn pockets should only be included on roads where traffic delay is a real concern (i.e. on higher order collector, or distributor roads). Careful attention is required to the provision for cycling in the vicinity of right hand pockets, where there may be local traffic weaving and turbulence. It may not be feasible to re-engineer much of the existing urban space to provide for segregated facilities. Integrated cycling solutions, based on the hierarchy of provision, are likely to be more effective in terms of cost and delivery. However, integrated facilities are likely to require significant changes to the traffic regime. The transport implications of significant reductions in speed and volume of traffic on key arteries to and through cities and towns needs to fully understood and planned for, within the sustainable urban traffic plan, before embarking on such changes. Disclaimer Glossary Acknowledgements Privacy Statement Browser Display Difficulty?